I've started this blog as a spot to list my parenting experiences with infant twins. They are boy / girl twins, and for those of you wondering, no they are not identical.... do you really need to ask? You would be surprised how many times my wife and I have been asked after just announcing their genders. They are categorized as being premature as they were born a month early. They are now currently about a week shy of 4 months old. I hope to tell some stories of experiences so far, as well as new events as they occur. 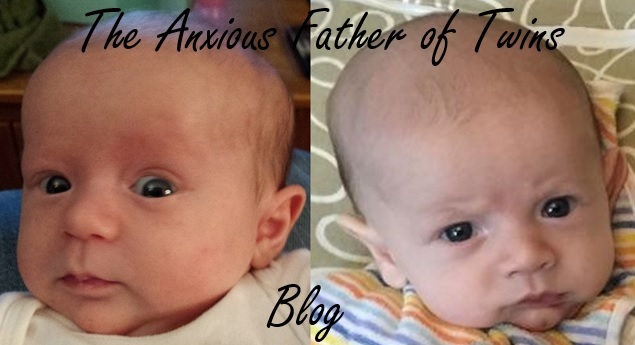 Why the blog title of "The Anxious Father"? Well, I've suffered from anxiety for quite a bit of my life, and having children just gives me more to worry about. I'm not meaning this in a negative way however; I would never trade them in for anything. More stories on anxiety to come. I owe a lot to my wife for the raising of our twins (and will continue to owe her a great deal, as this is just the beginning of their upbringing). To start off with, her belly became quite large during the pregnancy, and I know handling all that extra weight was not easy. She has since been a key factor in caring for the twins, as I went back to working full time while she takes maternity leave to care for them every day (and there are definitely many frustrating moments). As for a little about me, my day job is working in the electronics engineering field, developing RF power transmitters. By night, I try to help out my wife with the twins.